﻿ Can Bale and Ronaldo play together in Real Madrid? 02.08.2013 » Can Bale and Ronaldo play together in Real Madrid? 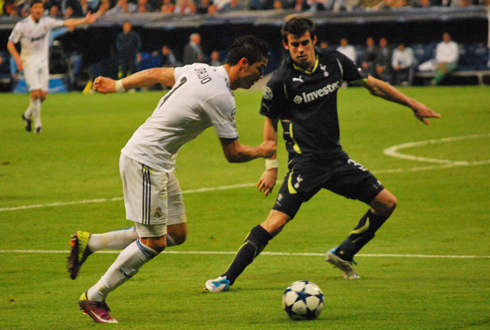 One of the biggest transfer sagas of the 2013 summer is the speculation surrounding Tottenham Hotspur's #11 winger Gareth Bale. His astonishing season last year for Spurs in the English Premier League duly won him the PFA Player of the Year Award, and the subsequent media frenzy following the speculation of the 24 year-olds future at White Hart Lane has reached fever pitch - with Spanish giants Real Madrid seemingly the most likely destination for Bale to ply his trade. Real Madrid have been reported to have offered a world record breaking £85-million for Gareth Bale, with the player telling manager André Villas-Boas that he wants to leave, but should Spurs take it and run? Bale has made a name for himself as one of the best current British talents in the Premier League, but it's questionable as to whether he can make it in the Spanish La Liga with a truly world-class player like Cristiano Ronaldo playing in the same team - who also plays in the same position as Bale. Surely Real Madrid wouldn't have bid £85 million for a player to just sit on the bench - likewise they could not keep Cristiano Ronaldo as a sub. So could it also mean Manchester United getting "their" Ronaldo back? Probably not. A team with Ronaldo and Bale in - that is, if they could actually fit in the same team together - would surely be a football fan's attacking dream, with Madrid fans certainly having a great shout to triumph over bitter rivals Barcelona. 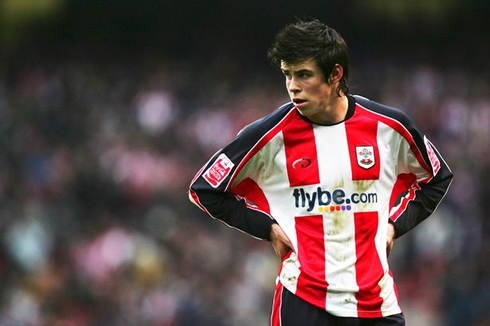 Bale originally started his career as a left-back for Southampton, coming through their youth academy and making 40 appearances in his first professional football season before joining Spurs in 2007. However, it was former Spurs boss Harry Redknapp's decision to move Bale into midfield that has transformed the Welshman from being the new kid on the block, to one of the most coveted players in world football. When Ronaldo was at Manchester United, he was one of the best players in the world at that time (and indeed still is), much like Bale is now. The sort of self-belief that having that title brings will surely help them along if they're playing for the same team. Having such similarities between them should only help ease the transition between the two – and good players can always (supposedly) play together. Just look at Barcelona! Ronaldo was brilliant in his 6 years in the English Premier League, playing virtually every game for the Red Devils, he was hard to contend with. Making defenders quake in their boots, he will always be remembered by everyone in England as the player who could trick defenders and score magnificent goals. This is much like he is now at Real Madrid, always tricking defenders or slipping by them without much effort. By contrast, Bale has had only one outstanding season in the Premier League – that being this last season, scoring an outstanding 21 goals and getting 9 assists. But it is just one season. In the 2 previous seasons combined, the Spurs midfielder only amassed 17 goals. Cristiano Ronaldo, on the other hand, managed just 18 goals in his final Premier League season (2008/09) but in the two seasons before that, he scored a combined total of 48 goals. Ronaldo even beats Bale when it comes to creating goals too. Whilst Ronaldo managed 31 assists in his final 3 EPL seasons, Bale has only created 25 in his last 3 Premier League seasons. So it seems Real Madrid would not really be getting value for money with Gareth Bale as an individual. But what about as part of a team? Can Bale and Ronaldo really play in the same team? Well, thanks to the Portuguese manager André Villas Boas, Bale's game has become more centrally-focused, with the Spurs midfielder playing just behind a centre-forward, as part of a 4-2-3-1 formation. Ronaldo has largely been deployed on the left at Madrid in a similar formation, having free licence to cut inside onto his favoured right-foot whenever he likes. There is the danger that Bale could take up the space that Ronaldo likes to cut in to (as shown by the graphic here – notice how both players are roughly in the same position on average) and make it harder for the Portuguese winger to get his spectacular long-shots away. The flip side for Madrid is that Bale does sometimes come deep to receive the ball and will help his deeper midfielders out defensively too. Every club Cristiano Ronaldo has played for has always made him first choice, so could the arrival of Bale jeopardise that? We don't think so - both have played in the English Premier League, which could potentially see the two bond over their relative experiences. The experience of being a fan favourite for their respective teams – Ronaldo more so as both Madrista's and United fans love him – will mean even more is in common between them, so there are certainly a lot of similarities between the pair. On the other hand, Ronaldo is regarded as having one of the biggest egos in football and there is some doubt as to whether another "superstar" on his patch would sit right with him. It wouldn't be the first time Ronaldo has been alongside other "star" players, however. He was part of one of the most lethal front-three in Premier League history at Manchester United, playing alongside Wayne Rooney and Carlos Tevez, so he has shown himself to be more than compatible with other big names. 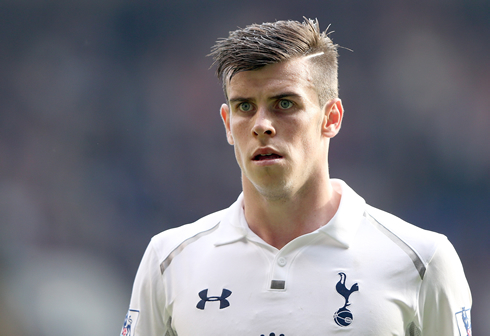 Many say Gareth Bale moving to Real Madrid is too soon for the young Premier League star. Surely the huge fee of £85 million would put so much pressure on his shoulders, especially at the biggest club in the world with millions of supporters expecting great things. And it could effectively signal a contract to the rest of his career being with Real Madrid, as if he were to move to another club or back to the Premier League – not many clubs could afford such a fee to enable the Merengues to still make a profit. We personally believe that, while the hefty fee will put enormous pressure on the young Welshman's shoulders, the lure playing for a team like Real Madrid is a chance that may only come around once and no player can really turn it down. Bale and Ronaldo can certainly be a success playing together – they can both play on the left or centrally just behind a single striker and will no doubt swap positions throughout the match, causing all sorts of havoc for opposition defences. Whether or not the Gareth Bale transfer does go through, one thing everyone can agree on – Ronaldo will always be top dog. Whether that's at Real Madrid, Manchester United or elsewhere, his personality, skill and "brand" means he is always going to be the number one player. Cristiano Ronaldo next game for Real Madrid will be against Everton, this next Saturday (August 3, 2013), for the Guinness International Champions Cup semi-finals round. In the meantime, you can watch Real Madrid vs Everton, Liverpool vs Olympiakos, Monaco vs Tottenham and Arsenal vs Napoli, all matches provided from our live football section.